Prepare for the 150 degree super summer heat....and save money! During hot summer months, temperatures in your attic can reach up to 150 degrees. Spring is the right time to consider installing an attic fan or having your existing fan serviced or replaced. Proper attic ventilation is crucial in avoiding wood rot, mildew and peeling exterior paint, in addition to roofing deterioration and energy loss. 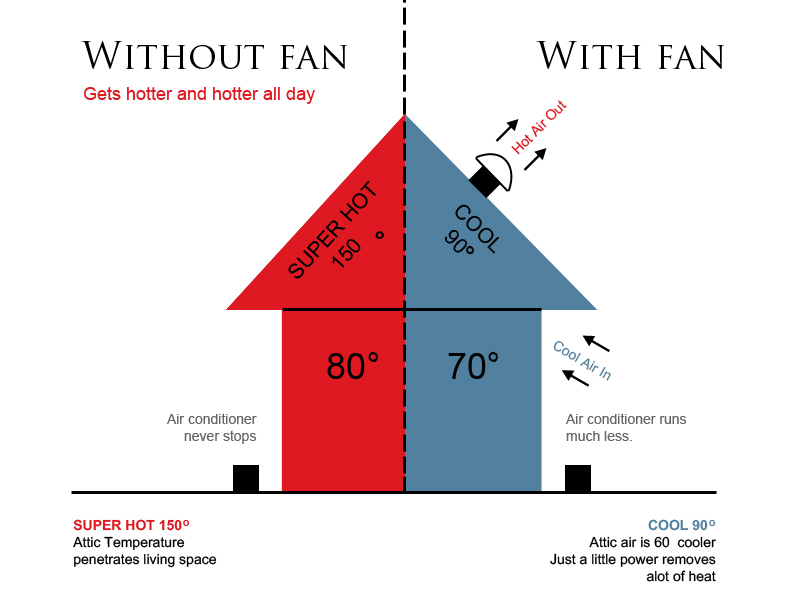 A correctly installed attic fan lowers the temperature inside your attic by creating positive airflow -- blowing out excess hot air and drawing in cooler outside air. If improperly installed, your fan will pull cooler air up out of your home and into the attic, robbing you of your costly air-conditioning. This will tax your a/c unit and directly raise your utility bill. Using a thermostat-controlled attic fan, one that turns on only when needed, can save you up to 30% on your air conditioning costs. At Trunnell Electric, we are experts at installing, servicing and maintaining attic fans. Our highly-skilled technicians install only quality, energy-efficient fans and are experienced in solving all attic fan related issues - whether it be replacing spent fan motors, designing proper venting to optimize function, or in servicing existing fans to cut down on noise and maximize efficiency.